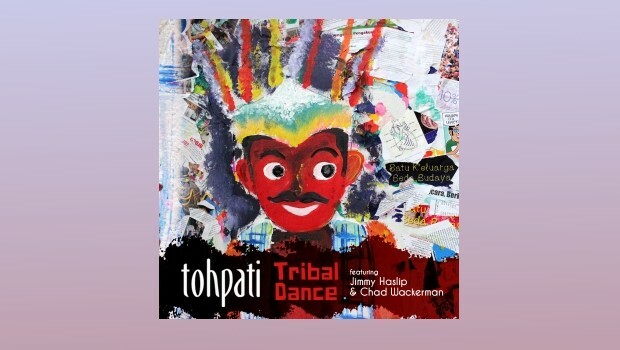 With his third release for Moonjune Records under his own name, Indonesian guitar virtuoso Tohpati dispenses with the bluesy feel of last year’s Riot album, and with Tribal Dance melds ethnic melodies to an advanced form of jazz rock, the like of which is hard to put a handle on for uninitiated Western ears. Aided here by veteran session men Chad Wackerman on the drums and Jimmy Haslip on bass, the eight compositions on this compact and dazzling record take us out into space via stop offs deep in the Indonesian jungle. Recorded live in the studio the three musicians draw on their many years of experience and fire off one another with an evident joy that that easily transmits through to the ones and zeros that end up on the CD. All the tunes bar the album closer which was recorded in Tohpati’s home town of Jakarta were laid down in a studio in Hollywood of all places. Right from the off Rahwana displays the locked down groove and the intuitive interplay between the trio, as syncopated arpeggios give way to chunk-funky powerchords before changing tack into an ethnic melody line. This eventually leads into some acid-infused space rock dissonance, flying off into Hendrix-meets-McLaughlin flurries, the whole thing hanging together with a natural ease. The fact that it is all done live in one take is frankly unbelievable until you see it on the video above. This first track neatly sums up everything that is so spellbinding about the ensemble’s performances on the album. Spirit of Java conjures intricate towers of architectural splendour without once sounding twee, as Westernised versions of ethnic music are often prone to do. The tune develops into a funky strut topped off by some lightning fast runs from the main man before returning to the mysterious theme. Haslip gets to show his fabulous sinuous dexterity on Tribal Dance the track, and gets another spotlight in Run, as well as contributing some lithe playing throughout. Wackerman is always well up in the mix, his powerful shots emphasing musical points at all the right times, and he even gets a short solo on Supernatural.However, for the most part these masters of rhythm are there to anchor Tohpati’s flights of furious fancy to somewhere near an Earth orbit, or to draw the spotlight to his scorching fretwork. I swear I saw my CD player levitate around three minutes in to Supernatural, such is the power of Tohpati’s molten metal runs up and down the fretboard. And, he never “shreds”, that first and sometimes last point of call for those guitarists lacking in the requisite imagination. This has nothing to do with clinical displays of ability, but everything to do with a heartful of soul. Tohpati’s nevertheless unquestionable chops are always at the beck and call of his musical spirit and they never get to needlessly dominate proceedings. The scorching hot Supernatural is worth the admission fee alone, and it is followed by the meditative qualities of the closing track, a solo effort from Tohpati recorded on home turf. The calming affect of Midnight Rain is much needed after Supernatural’s buffeting otherworldly forces. And so a wonderful album ends, and if ever there was a candidate for the repeat button, Tribal Dance is that album.